Lemon Berry French Toast Casserole combines two favorite flavors in one yummy breakfast recipe! 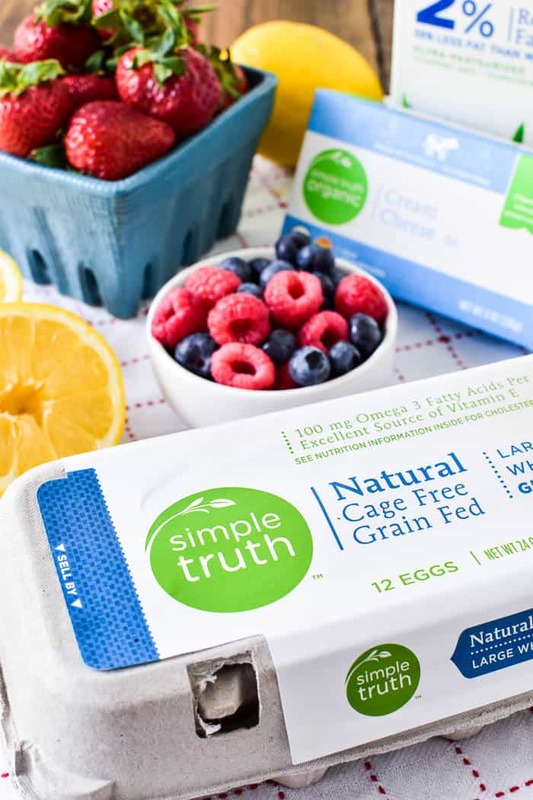 It’s the perfect addition to any spring or summer brunch, and can even be prepped the night before for an easy, stress-free morning. 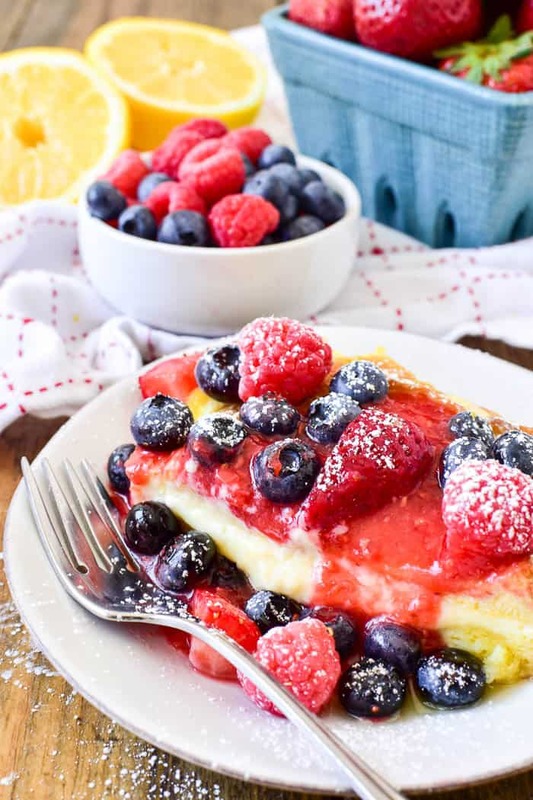 This Lemon Berry French Toast has a sweet lemony syrup and a creamy cheesecake filling and is topped with fresh berries and a simple berry sauce. Sprinkle it with powdered sugar and fresh lemon zest for an easy yet elegant brunch recipe that’s sure to become a favorite! Do you ever look at your weekend schedule and just want to crawl back in bed? Because honestly, that’s how I’ve been feeling lately. Like there are a million things I’d rather be doing than what’s actually on our agenda. Don’t get me wrong – it’s all good stuff. It’s just there’s SO much of it! Between soccer games and family parties and First Communions and Mother’s Day, it feels like there’s little to no time to relax. Which is what weekends are all about….right!? The good news? It really is all good stuff. And….a lot of it involves food! Which is always a bonus. So even though it might not be exactly what I want to be doing, at least I know there’s good food to be had. And since brunch is my very favorite meal of the day, and so many spring events seem to revolve around brunch, it’s like a double win! 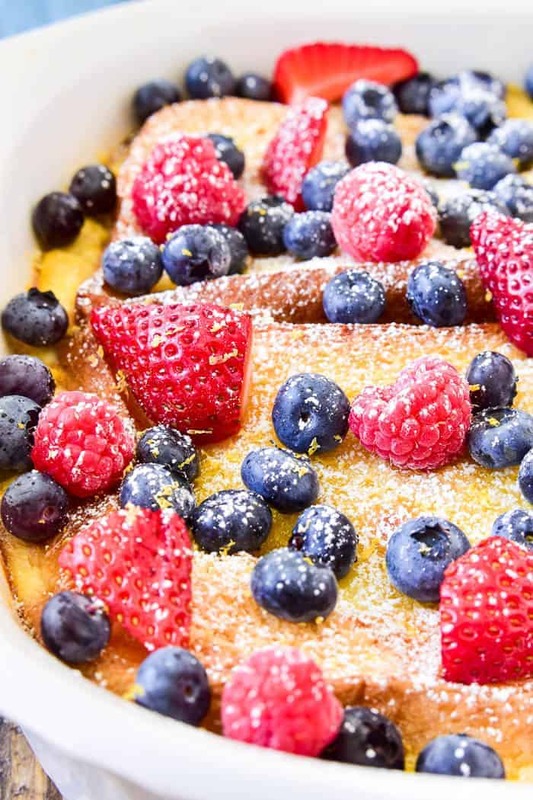 Especially when brunch involves this Lemon Berry French Toast Casserole. It’s no secret that I’m a sucker for a delicious breakfast casserole, and honestly? I like the sweet ones and the savory ones and every one in between. From Cinnamon Roll French Toast Casserole to Overnight Sausage Egg Casserole to Peach Cobbler Baked French Toast, I’ve never met a breakfast bake I didn’t love. But I’m telling you….there’s something about this Lemon Berry French Toast Casserole that’s extra. Extra special, extra delicious, extra amazing. Between the sweet lemony syrup and the lemon cheesecake filling and the homemade berry sauce, this french toast is EVERYTHING. And…it couldn’t be easier to make! HOW DO YOU MAKE LEMON BERRY FRENCH TOAST CASSEROLE? Combine butter, sugar, corn syrup, and lemon juice in a small sauce pan. Heat until butter is completely melted, stirring regularly. Pour mixture into a greased 9×13 inch pan. Prepare cheesecake filling by mixing cream cheese and lemon curd until smooth and creamy. Divide mixture evenly among 5 pieces of thick bread; top each with another piece of bread. Place in a single layer in your 9×13 inch pan. In a separate bowl, combine eggs, milk and half & half. Whisk until smooth and pour over bread. Cover and refrigerate overnight OR bake immediately at 350° for 1 hour. Dust with powdered sugar and top with fresh berries. HOW DO YOU MAKE FRESH BERRY SAUCE? In a medium saucepan, combine strawberries, raspberries, sugar, orange juice, and lemon juice. Heat over medium heat, stirring, for 5 minutes. Transfer mixture to a blender or use an immersion blender. Blend until smooth. Return sauce to pan and warm over low heat until ready to use. 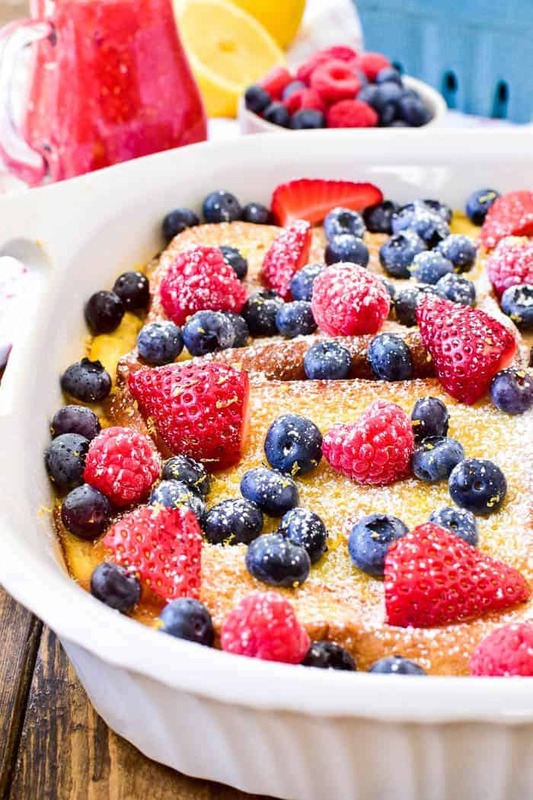 I especially love this Lemon Berry French Toast Casserole because it’s made with tons of Roundy’s and Simple Truth ingredients from Pick ‘n Save. From the butter to the eggs to the cream cheese and milk, this recipe is loaded with delicious, affordable ingredients I feel good about feeding my family. I found everything for this recipe at Pick ‘n Save (my go-to grocery store)….including the yummy brioche bread from their bakery. And I’m telling you. The bread makes all the difference! And the fresh berries…..and the powdered sugar…..and the lemon cheesecake filling. Ha! So pretty much what I’m saying is this recipe is a MUST MAKE. You’ll love everything about it….guaranteed! For more recipe inspiration, visit Pick ‘n Save on Facebook, Twitter, Pinterest, and YouTube. This stuffed French toast has a sweet lemony syrup and a creamy cheesecake filling and is topped with fresh berries and a simple berry sauce. Sprinkle it with powdered sugar and fresh lemon zest for an easy yet elegant brunch recipe that's sure to become a favorite! In a small saucepan, combine 1 stick butter, 2/3 c. sugar, 2 Tbsp. corn syrup, and 1 Tbsp. lemon juice. Heat, stirring, until butter is completely melted. Pour mixture into greased 9x13 inch pan. In a small mixing bowl, combine cream cheese and lemon curd and mix until smooth and creamy. In a separate mixing bowl, combine eggs, milk, and half & half. Whisk until smooth. Pour mixture over bread in pan. Cover and refrigerate overnight (optional) or bake at 350° for 50-60 minutes. Remove from oven; dust with powdered sugar and top with fresh berries. Drizzle with berry sauce as desired. Combine all ingredients in a medium saucepan. Heat on medium heat, stirring often, for 5 minutes. Use an immersion blender or transfer mixture to a separate blender or food processor. Blend until smooth. Serve warm over French Toast Casserole. I cannot wait to try this out on the weekend for the family! This looks INCREDIBLE!! 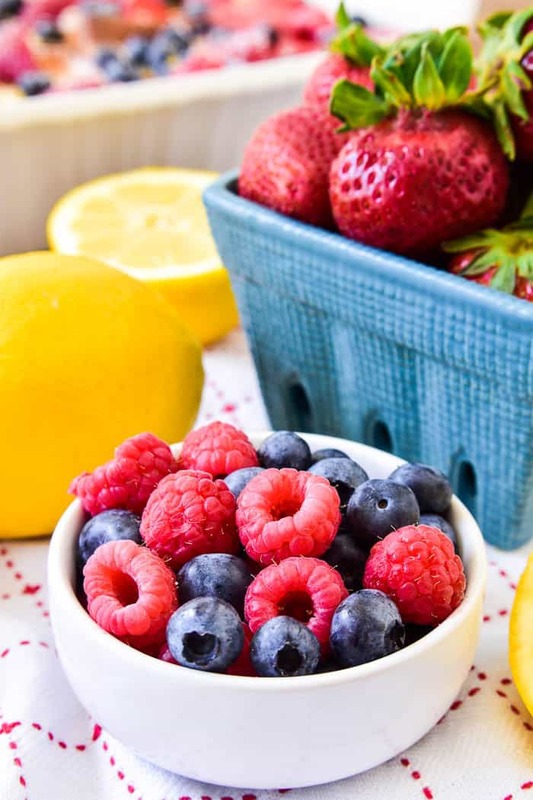 Love the lemon & berry combination…yum! Look at all of those lovely berries! This is such a great excuse to host a brunch! I am participating in Brunch Week and I have seen so many amazing recipes. This may be my very favorite! Breakfast sent from heaven. I am in breakfast heaven! The perfect breakfast for summer! Loving all the fresh berries mixed with lemon. Making this for the kids this weekend! You have just opened the season of spring and summer beauties ! Thank you ! Could this be reheated? How would you recommend doing so?